When the Fed increases interest rates, your bonds lose value. When the Fed decreases interest rates, your bonds gain value. Since interest rates were rock bottom last year, they have nowhere to go but up. The Fed also announced that there would be several increases in rates to come. Does this mean we should wait until the Fed stops increasing rates to buy shares of bond ETF's at a bargain rate? Take the example below. SPTL is a long term treasury ETF. It has been moving in the opposite direction as the federal funds rate. It's not just SPTL, but also most aggregate bond funds and municipal bond funds have been declining in value. When people say "you can't time the market", does that only apply to stocks? Because I see clear indications of how bond funds can move. The key point is that there is not one single "interest rate". There are rates for several key durations, from 1 day up to 30 years. The longer-term rates indicate the market's expectation of what shorter term rates will be in the future. 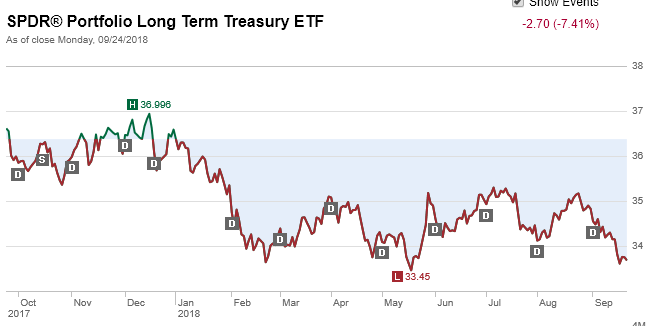 So a long-term Treasury Bond ETF will be priced with those expectations in mind. 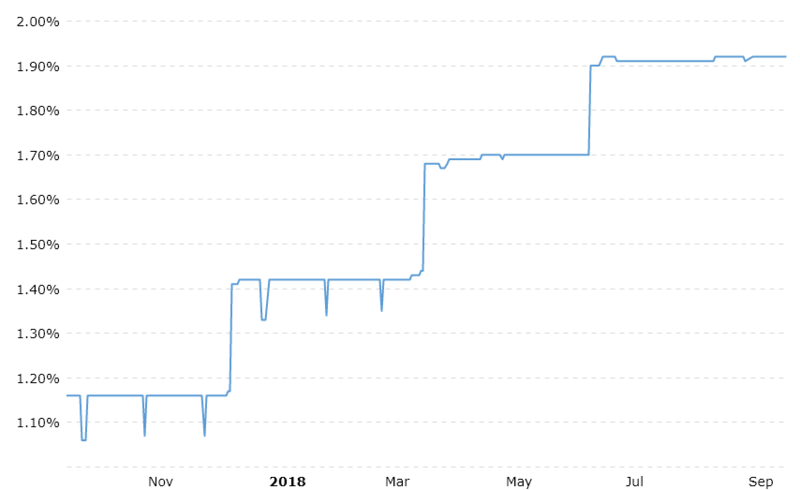 Certainly when rates actually do rise, then the price of the ETF will fall because the rise has gone from expectation to certainty, and the underlying bonds in the ETF will fall, but the opposite could also happen. If the fed does NOT raise rates (or even lowers them) when the market expects them to, then the prices of the ETF might rise to reflect that missed expectation. Does this mean we should wait until the Fed stops increasing rates to buy shares of bond ETF's at a bargain rate? How do you know when they stop? Yes you'll probably get a little bit lower price as rates climb, but there's really no way to know when the bottom has hit. When people say "you can't time the market", does that only apply to stocks? Not at all. It applies to any market (bonds, commodities, fx, etc.). Investopedia defines market timing as "the act of moving in and out of the market or switching between asset classes ... it is extremely difficult to predict the future direction of the stock market." In the big picture, that's completely true. On a more granular level, investors make timing moves all of the time. Averaging down when your position has lost value? Buying a stock because you thinks it's undervalued, or vice versa? Selling a covered call because you think that the strike price is at your target sell price and the call premium is gravy? Asset reallocation? Increasing fixed income when you become more risk averse either due to market height or you get closer to retirement? So you can't time the market but IMO, people sure make a lot of timing decisions, many of which are effective. As for being able to predict the share price of a bond ETF in response to change in rates, there are some factors that you can assess. A bond’s maturity and coupon determine how much price will change when rates change. Bonds with lower coupons tend to lose more with rate rise. The longer the maturity, the greater the the impact of rate increase. Therefore, the composition of the ETF will determine a large part of the ETF's reaction to change in interest rates (Fed funds rate versus long term rates). The other part will be the perception of the market - interest rate sensitive securities often over or under react due to the amount of buying or selling. Not the answer you're looking for? Browse other questions tagged bonds interest-rate federal-reserve or ask your own question. Why can't the Fed lower interest rates below zero? What are exactly these “interest rates” you hear about in relation to the Fed?